Drywall Anchors: Which One Should I Use? Drywall—comprised of compressed gypsum (a soft sulfite mineral)—creates wonderfully smooth walls. Yet insert a nail or screw into it and it’s likely to crumble, often resulting in the fastener working loose and the hung item falling to the floor. 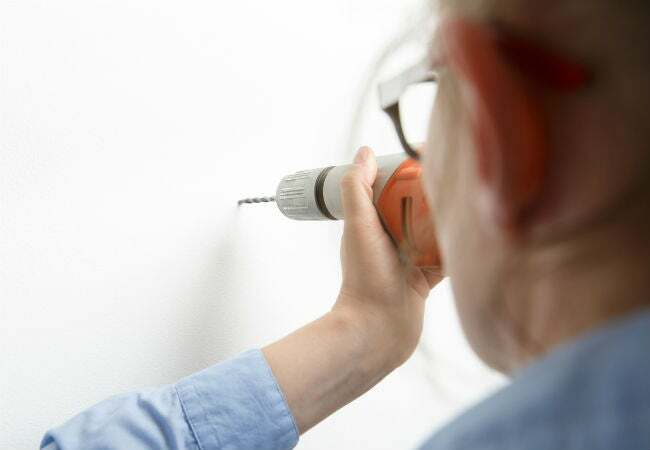 The solution is to use drywall anchors, which are designed to spread within or behind the drywall panel, creating pressure that locks the anchor in place. Before you pick up any old anchor, shop smarter by considering the support you need for the wall-mounting project at hand and selecting the type of drywall anchor—sold on their own or in sets with screws—to match it. There are four different types of drywall anchors, largely distinguished by the weight of items to be hung. Keep reading to understand what’s available and check out our picks for the best drywall anchors in each category. Drywall anchors come in various designs, sizes, and holding power (maximum weight of an object you can safely hang). While manufacturers are not required to list their anchors’ holding power, many do, either on the package or in the included literature. Additionally, basic drywall anchor types are associated with a range of holding power (see individual anchor descriptions below). Always use an anchor with a holding power that meets or exceeds the weight of the item you want to hang. 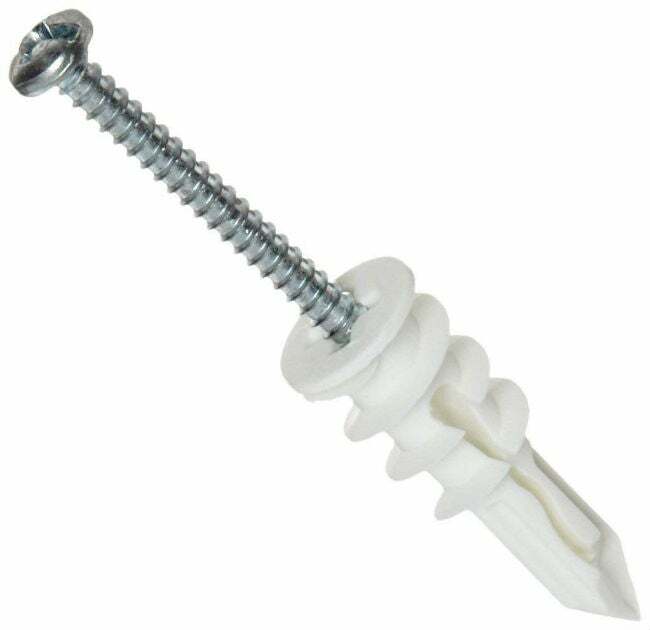 Drywall anchors can be purchased separately from the screws they hold in place, but it’s wise to buy anchors that come packaged with the correct size screws if you don’t have a wide variety of screws handy. 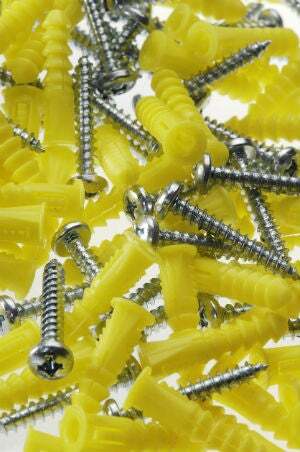 If you prefer to purchase the anchors and screws separately, you’ll find the required screw size on the package. If the type of anchor you select requires a pre-drilled pilot hole, you will also find the corresponding drill bit size on the package. True to their name, expansion anchors spread to create a tight bond with the wall and are designed to hold lightweight items. The anchor’s shank (tapered end) is split in half. To install, a pilot hole is drilled in the wall, the anchor is fitted into the hole, and then a hammer is used to lightly tap the anchor head flush with the wall. 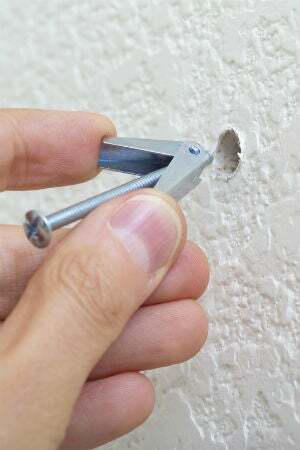 When a screw is inserted into the anchor, the split ends of the shank spread, expanding and putting pressure on the inside of the drywall to hold it securely. Often made of plastic but may also be made of nylon or zinc-coated metal. Affordable, averaging $.03 to $.20 per anchor, depending on size. Easy to install and DIY friendly. Able to hold between five and 25 pounds, depending on brand and size (larger anchors hold more weight). Not suitable for use on ceiling drywall as downward pressure could cause the anchor to slip out. 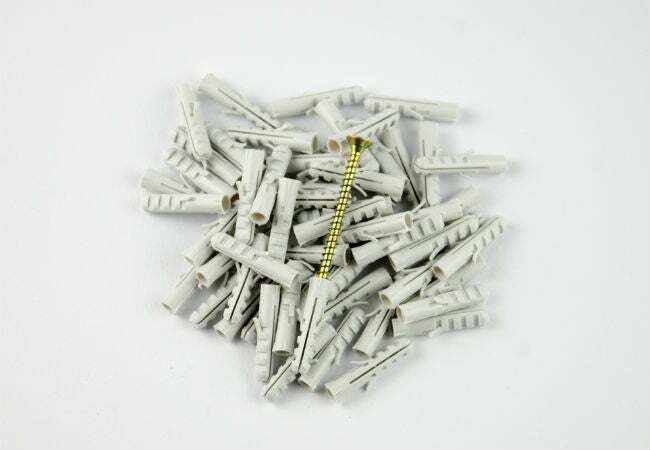 Also called “self-drilling” or “self-tapping” anchors, threaded drywall anchors are made from hard nylon or metal and are able to hold heavier items. They feature sharp, pointed shanks that can be screwed into the wall without a pre-drilled hole by using a screwdriver or a screw gun. Once the anchor is in the wall, the screw is inserted, which forces the sides of the anchor to flare and wedge the anchor tightly against the drywall. Holding power of 25 to 75 pounds, depending on size. Self-drilling; no pilot hole necessary. Cost $.25 to $.40 per anchor, depending on brand and size. Easy to install with screwdriver or screw gun. Not suitable for use on ceilings. 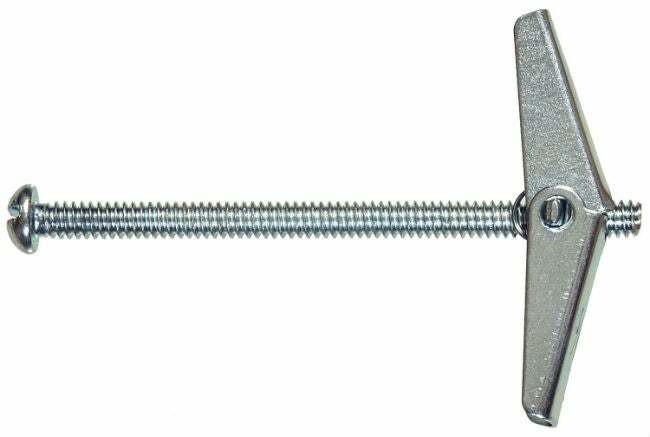 Known as “molly bolts” or simply “mollies,” these metal sleeve-type hollow wall anchors provide medium-weight holding power, but offer a unique feature—the ability to remove the screw and reinsert it if necessary in the future. Here’s how it works: A pilot hole is drilled into the drywall and then the anchor is inserted into the hole. The underside of the anchor’s head features sharp metal tips that pierce the drywall surface. When the screw is inserted in the anchor, each twist of the screw forces the shank of the anchor to compress (lengthwise) while it expands sideways. When correctly inserted, the screw can be removed from the anchor, which remains securely in the wall and then reinserted. This makes it handy if you’re replacing items in the same spot—such as toilet paper holders. Have a holding power of 25 to 55 pounds., depending on size. Have a permanently attached shank, but the screw can be removed. May be used in ceiling drywall for lightweight items, such as smoke alarms. When you need serious holding power, opt for toggle anchors, which come in a variety of sizes, designs, and materials, including metal and plastic. Traditional metal toggle bolts are the strongest of the bunch, but they’re not the simplest to install because they require drilling a hole that’s approximately three times wider than the diameter of the bolt (necessary to insert the anchor). With these, the anchor features one or two bars (or wings) that fold flat against the bolt during insertion. Once inserted, a quick twist of the bolt loosens the wings, causing them to flare outward. As the bolt is tightened with a screwdriver, the wings draw inward to form a strong perpendicular brace along the backside of the drywall. The installation challenge comes in keeping the bolt centered in the hole while tightening it. It takes some practice and patience to get it right, but once you do you’ll be impressed by the strong holding power. It’s more likely that the wall itself will fail before the toggle bolt does. Winged plastic anchors (the new kids on the block) feature plastic “wings” that fold tightly together so the anchor can be inserted into a pre-drilled hole. Once the anchor is in place, a wand (included with the anchor) is pushed through the hole to expand the wings on the backside. A screw is then inserted, which draws the wings snugly against the back of the drywall. Maximum holding power for metal toggles is 100 pounds, depending on size; plastic wing toggles have a holding power up to 20 pounds, depending on size. Both metal and plastic toggles can be used on ceilings at 1/3 the holding power listed for walls, up to a maximum of 15 pounds. Drywall may pull away from ceiling joists at heavier weights. Metal toggles can be difficult to keep level in the wall during installation. Our top four drywall anchor picks consistently excel in home use and are favorites among DIY customers. Unless noted differently, holding powers listed are for standard, 1/2” thick drywall. For reliable support in light-duty situations (up to 15 pounds), rely on the Qualihome Ribbed Plastic Drywall Anchor Kit. It comes with 201 pieces (100 pairs of anchors and screws), so you’ll have plenty of anchors on hand. The anchor shanks are split, allowing them to expand (with screw insertion) for snug attachment. Amazon buyers give this kit 4.5 out of five stars for ease of installation and for the included drill bit (no need to hunt for a bit in your toolbox). Available from Amazon. Manufactured from glass-filled nylon, TOGGLER SnapSkru Self-Drilling Drywall Anchors are rigid enough and sharp enough to screw into drywall without a pre-drilled hole. Amazon buyers give these anchors 4.3 out of five stars, citing ease of use and hefty holding power, securely hanging items up to 45 pounds. 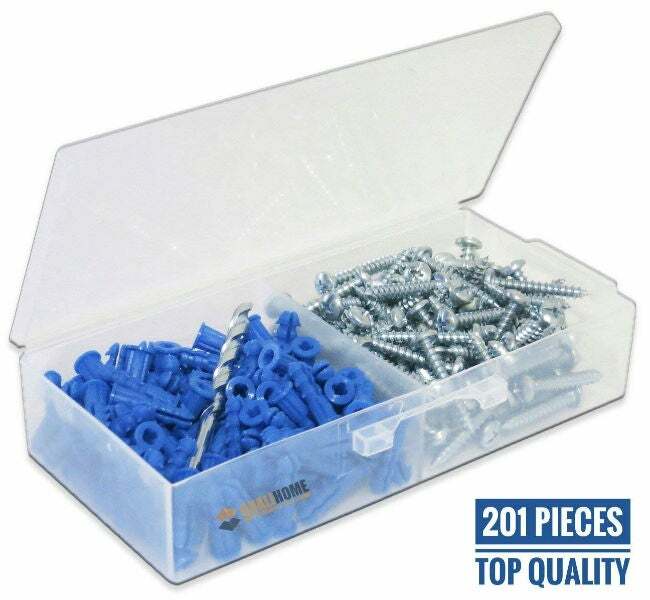 The pack of threaded anchors contains 50 anchors and 50 screws. Available on Amazon. For versatility in the molly bolt category, go with the Glarks Heavy Duty Zinc Plated Steel Molly Bolt Assortment Kit. 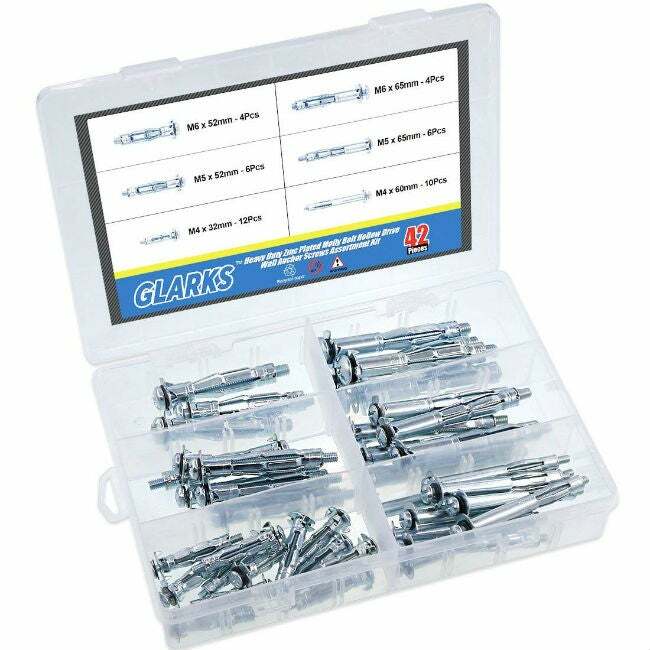 It comes with 42 anchors in six sizes, and is intended for use on 1/2”, 5/8”, and 3/4” drywall (two anchor sizes for each drywall thickness). Made of zinc-plated carbon steel, the largest of these sleeve-type wall anchors will safely hold items up to 50 pounds when installed in 3/4” drywall. The smallest anchors hold up to 18 pounds in 1/2” drywall, and the medium-size anchors hold up to 25 pounds in 5/8” drywall. You’ll find these mollies suitable for hanging coat racks, mirrors, and other medium-weight items—no wonder reviewers gave them 3.8 out of five stars! Available on Amazon. With a holding power of up to 55 pounds, it’s tough to beat Hillman Group Toggle Bolts for installing shelving and other medium-weight items. You can also use these toggles to hang items that weigh up to 13 pounds from the ceiling. Amazon buyers give Hillman Toggle Bolts 4.5 out of five stars for their exceptional strength, noting that they’re the “best anchors if you can’t find a stud.” Available from Amazon. This entry was posted in Custom Home Building, Design and tagged home improvement. Bookmark the permalink.